home of the rare desert elephant and black rhino. This area is also the home of the original inhabitants near Twyfelfontein, a World Heritage Site with rock paintings on red sandstone that are over 6,000 years old. The Himba people will be our next stop—who are a proud and statuesque ethnic group that adheres to their traditional cultural values. Our final experience will be the famed Etosha National Park, home of 93 animal species and 340 bird species. Etosha is known for their salt flats and watering holes, where we hope to see groups of animals lined up side-by-side to drink. It is the combination of otherworldly landscapes, intact indigenous tribal people, and wildlife living in harsh environments that makes Namibia such an unusual and desirable destination. We will stay in luxurious safari camps, some with panoramic views of the surrounding desert environment. This tour is designed to dovetail with the Safari to Botswana or it can be enjoyed as a stand- alone tour. For those coming from Botswana, there will be a direct flight from Maun to Windehoek on Sunday, May 31. If you are flying from the United States via Johannesburg, plan to arrive in Windehoek on May 31. After your arrival at the Windhoek International Airport, your guides will be waiting for you in the arrival hall. From here we will be traveling via mountainous terrain to Windhoek, the capital city of Namibia. With roughly 350,000 inhabitants, Windhoek constitutes the largest city in the country and is situated in a lush and scenically appealing valley of the Auas Mountains, Namibia’s second highest mountain range. Due to its central location, the city serves as the perfect vantage point to Namibia’s vast array of tourist destinations. The city is a kaleidoscope of modern and traditional cultures, fashions, and architectural styles. In the evening we will enjoy typical Namibian cuisine in one of the numerous restaurants in the city. Leaving Windhoek behind us, we will be traveling south through bush-land savannah to the edge of the escarpment, which demarcates the beginning of the Namib Desert - the oldest desert on earth, formed by the effect of the cold Benguela Current. There is no rainfall in this desert; instead, an early morning fog provides moisture to support all its living organisms, including the welwitchias—rare botanic plants that hug the ground and have surface roots to absorb moisture from the fog. Some of these plants are over 1,000 years old. 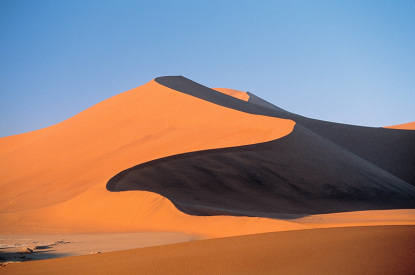 Sossusvlei is an area well-known for some of the highest and most picturesque dunes on earth. These monumental dunes are a sought-after subject for photographers, as their warm tints range from pale apricot to brick orange and deep red, which contrast vividly with white clay pans at their bases. We will stay at the Sossus Dunes Lodge, the only lodge located inside the park boundaries, which allows us to get up early and be in position for sunrise and to remain after sunset. This is also an excellent location for photographing the stars or star trails at night. We will also visit Deadvlei, another salt pan that is known for its striking camel-thorn trees, which died over 900 years ago from lack of water. These skeletal trees make haunting photographs against the red backdrop of the large dunes. Today our journey proceeds through the isolated, rolling hills of the Kuiseb Valley to Swakopmund. Better known as Namibia’s playground, this idyllic town is wedged between the sweltering Namib Desert and the cold Atlantic Ocean. Swakopmund is a rhapsody of adventure, fun, exploration, and relaxation. Graced with many beautiful, old buildings in a colonial, Bavarian style, the best way to experience this small town is on foot. Later, in the better light of the cooler afternoon, we will venture into the valley of the Swakop River to visit the Welwitschia Plains and the aptly-named Moonlandscape to enjoy this astonishing area while the sun is setting. While in Swakopmund we will have the opportunity to take an optional flight in a small aircraft. I have seen many photographs taken on this flight and they are spectacular. Often described as “the flight of a life-time”, it takes you from the Swakopmund airfield along the Kuiseb River bed, the natural border of the large dune formations. From there it continues to Gogabeb, the Nambi desert research station. Although the Namib is just as dry as the Sahara, it has a much richer fauna and flora, attracting researchers worldwide. We continue our flight over Tsondabvlei and shortly the awe-inspiring dunes at Sossusvlei come into sight. The color and shadows of these gigantic mountains of sand change by the hour from beige to rust-red to purple, dazzling the eye. After Sossusvlei we fly over the forbidden diamond area where remains of old diamond mining camps can still be seen. Next we fly over the “sea of sand”, approaching the shore at Conception Bay. Soaring along the coastline we fly over the shipwreck of an old German passenger liner, the Eduard Bohlen. Stranded in 1909, she now lies inland, for the entire world as if she were sailing through the desert. Then the shipwreck of the fishing trawler, Shaunee, comes into sight. As we continue northward we see the never-ending battle for supremacy between the sand and the sea, as we pass the “Lange Wand”, a 500 foot high dune rising from the waters edge. As we near Sandwich Harbour, our pilot will ascend to 1500 feet. Sandwich Harbour is a large saltwater lagoon and home to an incredible variety of bird life and one of southern Africa’s most important natural bird sanctuaries. From Sandwich Harbour our flight takes us over the salt mines and Namibia’s major harbor, Walvis Bay, where we fly over the guano-collecting wooden platform, where thousands of seabirds settle and leave their droppings. Periodically the droppings are scraped up turned into fertilizer. The seaside recreational resorts Dolphin Beach and Longbeach are our next destinations, and as the town of Swakopmund comes into sight, your pilot will prepare for landing. We travel inland past the imposing Brandberg, Namibia’s highest mountain (2579m), into Damaraland. This part of Namibia belongs to one of the least populated and most geologically diverse areas in Africa and is home to the rare desert elephant and the black rhino. These animals often walk up to 40 miles in the cooler night to reach distant watering holes. In addition to the wildlife, we will see the local Acacia montis-utsi (Brandenberg acacia) and the odd Welwitschia mirabilis desert plant. Today we will visit Twyfelfontein, world heritage site, where bushman communities engraved and painted over 2,500 pictures some 6,000 to 7,000 years ago on the red sandstone. These are the most extensive and finest collection of petroglyphs in Africa, which depict numerous wild animals that drank from a nearby spring. Some walking is required to visit the art. We will also visit a traditional Damara village, a tribe that, together with the bushmen, were the original inhabitants of Namibia. This morning we will view the 260 million-year-old logs of the Petrified Forest and again see many of the unique desert plants. From here we will be traveling through a network of dry river beds and interspersed acacia plains into the rugged and unspoiled Kaokoland, an area marked by undulating hills and open plains inhabited by the Ovahimba or the Himba. This intact tribal group is part of the larger Herero-speaking people who inhabit the remote northwest Kunene Region and are often referred to as Kaokovelders. The Himba are a semi-nomadic group who travel from watering hole to watering hole. They are tall and statuesque, and the women are noted for their beauty, which is enhanced by elaborate hairstyles and a red-ochre and fat solution that they rub on their bodies and hair to protect themselves from the harsh desert environment. They adorn themselves with beautiful jewelry made from shell beads with unusual and dramatic designs. They live in simple cone-shaped homes made of saplings bound together with palm leaves and covered with mud and dung. The men in the tribe build the structures, while women mix the clay and do the exterior plastering. Our lodge is situated on a hill with a spectacular 360-degree view over the Kaokoland. Here we will visit an Ovahimba Village. These proud and statuesque people still adhere to their traditional values and cultures. Leaving Kaokoland behind, we will be traveling through Ovamboland to the world renowned Etosha National Park. This unique large area consists of wide-open plains and dense-bush savannah that surrounds a parched salt desert known as the Etosha Pan. This desolate saline depression shimmers with terrestrial heat during the hotter parts of the day and is surrounded by a number of waterholes that ensures the survival of 114 different game, as well as 340 different bird species. We will wait in anticipation at a selection of waterholes that supports a rich diversity of mammals and birds, some of which are rare and endangered species, such as black-faced Impala, Roan, Black Rhino, as well as the Elusive Eland, the largest antelope. Each waterhole we visit holds a surprise, as no game drive is ever the same and we will keep our eyes peeled to try to glimpse the trunk of an elephant, the yellow eyes of a lion or the checkered face of a leopard. We will have numerous game drives in Etosha National Park, always rising early to capture the best light and avoid the intense heat of the day, when we can cool off in one of the two expansive swimming pools. In your free time you can visit the reptile farm on the property. I have worked with the excellent staff of Best Safaris for many years planning safaris to Africa. Prem Sharma and Gaby Gurrola work hard to ensure that our expeditions are comfortable, convenient, and place us in the best locations at the best times. We realize that, for many, an African safari truly is the “trip of a lifetime” and we strive to make your tour as interesting and memorable as possible. We have selected superb lodges in different types of locations, and which provide the amenities that make everyone feel secure and at home. Professional, English-speaking tour guides/drivers and transportation in an air-conditioned 13-seater van, except in Etosha National Park, where we will use safari vehicles. Medrescue—Same as Flying Doctors, providing evacuation to nearest large city. Visas are not required in Namibia or South Africa for US citizens. Your passport must be valid for at least six months after your exit date from South Africa and must have at least three blank visa pages. Be sure the word “visa” is at the top of the blank page. Please make a copy of your passport and other important papers and carry two additional passport photographs. International Health Card. A yellow fever vaccination is required, if you are entering or exiting to Uganda, Kenya, Rwanda, or any other countries in the yellow fever zone. Namibia and South Africa are not in the yellow fever zone, so if you are flying through South Africa, a health card is not needed. Credit cards are widely accepted in Namibia and these are recommended over large amounts of cash. Be sure to tell your credit and debit card issuers where you will be traveling, so they will not block usage or withdrawals. Game Drives. Please don’t be shy about requesting a rest from an early morning game drive. If you prefer to sleep in late, please let us know the night before. We normally will rise early for game drives and take a bush breakfast with us or return for breakfast at the lodge. Clothing. Plan to pack and travel lightly while on safari in Africa. The dress is always casual and clothing can be washed frequently. Layers are recommended for morning and evenings—a light fleece jacket will suffice. Be sure to bring sun block and any prescription medicines. Additional suggestions will come with subsequent information. More information will be supplied prior to departure. This trip is limited to 8 participants. Please email me for a registration form.